Many years ago, back before the EU and the Euro and the whole globalization thing, I was tootling around in Europe. In my admittedly hazy recollection, French francs were 6 to the dollar, German marks were 2 to the dollar, and Italian lire were something like 1,000 to the dollar. In the decades after WWII, Italy had some serious money problems: bills with so many zeros they make your eyes swim. And small change? It was just too crazy. The smallest bill was 500 lira. 5 lira coins and 10 lira coins, valued at less than a penny, were hardly worth the trouble, but many kinds of purchases ended up with these small amounts in play. The mint couldn’t keep enough coins in circulation to meet the need for small shops. So most of the time, when you went to buy groceries or a pack of kleenex or a newspaper, you’d pay with a bill and get your change in, well, stuff. I got bandaids once, and a pencil another time. But the most popular alternative was candy. This seemed quaint and charming to me at the time, a happy traveler just passing through. But there were problems. Because it turns out that although the shop can give you candy as change, they are unlikely to accept candy as credit toward the purchase of something else. Modern economies depend on MONEY as a single currency of exchange in every direction. Candy just doesn’t do. Well, Italy solved its problem when everybody joined the Union and the Euro took the place of their desperate currency in 2002. But it turns out that the candy money problem pops up in other places as well. For example: in Indonesia, a recent study revealed that 10 percent of the country’s retailers are giving change in candy. This has evidently been a long standing problem. In July, the retailers association agreed to stop doing the candy thing, and use only coins. The government promised to make more coins so no one would have the excuse of coin shortage. But still, the candy rules the cash register. The shop keepers claim they are charged a 1 percent premium by the banks for stocking change, so they prefer using candy. Consumer advocates advise paying with the exact amount to avoid the candy change trap. No representatives of candy-lovers were interviewed as part of the study, but I suspect at least one group of consumers has been happy with the current arrangement: the kids sent to the store to pick up some items for Mama need make no excuses when they come home with a fist full of candy sticks on the side. Read the story: Irvan Tisnabuti, “Many ‘Naughty’ Indonesian Retailers Still Make Change in Candy” Jakarta Globe Sept 12, 2010 You can read a description of the Italian problem in a Life Magazine article from 1971, “The Licorice Lira Problem” and more in “Numismatics on the Autostrada” in Texas Monthly, 1975. In 1921, Congress held hearings to deliberate the removal of a 5 percent “excise tax” levied on candy manufacturers in the wake of increased national war expenses. The National Confectioners Association, representing some 75 percent of the nations’ candy manufacturers, sent Hubert Fuller as their representative to argue against the special tax and explain why candy, among all the goods which had fallen under the new taxes, should be exempted. Fuller was an attorney, not a candy maker, and his testimony shows skill in the legal arts of dodge and spin. But his pleadings also provide an intriguing glimpse into the state of candy during the first World War and just after. When the Congressmen thought of candy, it seemed they were thinking of the kinds of candy they were likely to buy for the missus: a nice box of hand-dipped chocolates, selected from a fancy department store candy counter and selling for a dollar or more per pound. These luxury goods seemed fair game for raising extra revenue. But Mr. Fuller meant to portray the candy business as primarily a business of cheap goods and slim profits. He pointed out that more than 80 percent of the candies produced in the country were “penny” candies and 5 or 10 cent items. You would find these cheaper candy goods in neighborhood shops, in general stores, in “5 and 10 cent” shops. But these stores would not only be selling candy. They had many offerings to entice the pennies and nickels and dimes. And so was it fair, Mr. Fuller demanded, that candy should be taxed, while the rest of the penny universe was not? Mr. Fuller described the many dazzling alternatives to candy that you might also find at the candy shop. There were other delicacies like cookies, fancy crackers, raisins, stuffed dates, salted nuts. There were toys like marbles, tops, balloons, “squawkers,” paints and crayons [if you know what a squawker is, please tell!]. If none of these were to be taxed, then surely the discriminating customer would gravitate toward the better values for his or her precious pennies and nickles. Today many states are expanding their sales tax to include candy, but exclude “food.” If it has flour, it’s still considered food, even if it looks and tastes like candy. When we look back at this tax testimony from 1921, we can see that even then it was a widely accepted idea that “baked goods” were different from candy in some essential way, and therefore not taxed for extra revenue. But we can also see that the line between “candy” and “baked good” could be quite tenuous. I wish, gentlemen, we could take a child into a store in your presence and give that child a nickel and you could see the child consume half an hour or an hour of the time of the proprietor of that store shopping. Gentlemen, the child is the champion shopper of the country, and he will determine then whether he is getting a penny’s worth or a nickel’s worth or a dime’s worth of candy, or whether he is going to go out and buy something that is not paying any of these taxes, such as the tops or the squawkers or the marbles or these other things. The child is the champion shopper of the country! Now that is something. Here at Candy Professor, we are finding that candy explains everything. So now let’s explain the sorry state of American household finances today from the candy perspective. Since the 1980s, children have been deprived of the chance to wander into a store with a fist full of their own money and figure out if the nickel candy really is a nickel’s worth of candy. So when they grow up, they don’t know a nickel’s worth. If you’ve never properly shopped for candy, how can you possibly be expected to shop for an exotic adjustable balloon sub-prime mortgage? Candy? Or Not? Check the list. The candy sales tax goes into effect June 1, and officials at the Washington State Department of Revenue have been working to compile a list. All the candy, and all the candy like substances that are not candy. Candy is a preparation of sugar, honey, or other natural or artificial sweeteners combined with chocolate, fruits, nuts, or other ingredients or flavorings and formed into bars, drops, or pieces. Candy does not require refrigeration. Candy does not include any preparation containing flour. Flour is made from grain such as wheat, rice, corn, rye, oats, and barley. Flour does not include flour substitutes, such as starch. Any product that lists flour as an ingredient on the nutritional facts label is not taxable as candy. You can read more about the definition and its irrational craziness in my post Defining Candy: The Candy Tax. But if you’d like to check to see whether your favorite candy is actually candy, or some tax-free candy like substance, check out the spreadsheet at: http://www.dor.wa.gov/Content/FindALawOrRule/NewLegislation/Important.aspx click on “June 1 Candy and gum sales tax exemption repealed” then go to “List of candy products and products similar to candy.” In a particularly helpful gesture, the News Tribune (Tacoma) has created a nifty little search box so you can input your favorite treats and find out where they fall along the candy/no candy line. So far, the list includes something like 3,500 different candies in the state, and they had to check the ingredients of each and every one. More to come, though: the Revenue office just received a new distributor’s list of Asian candies sold in the state. 11,000 kinds. We knew about a few of the clinkers: Kit Kats, Twix, M&M Pretzel, and licorice will not henceforth be known as candy in Washington State. But Milky Way bars? Never saw it coming. The flour exemption was meant to carve out an exception for cookies. So now when you buy a 100 Grand Bar or a Look Bars, hey, it’ s not a candy bar at all! For a great story about the man behind the candy list, Patrick Gillespie, see Nicole Brodeur, “Candy Man’s job can be taxing” in the Seattle Times. What’s inside your favorite candy bar? Could be all kinds of yummy stuff: crispies, nuts, creme, something chewy, cookie wafers, raisins, coconut. I look at all those amazing combinations and I’m wowed by American candy ingenuity. So when I found out why all that stuff is in our candy bars, I was surprised. Ingenuity, yes. But first, necessity. 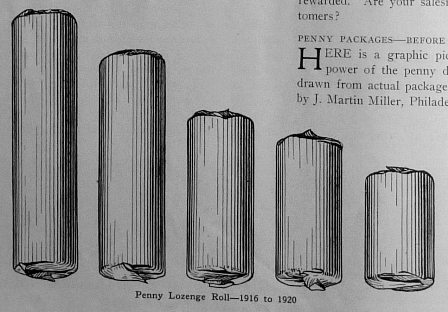 If you were making wafers or chocolate drops, you could either raise the price or, as in the case of those penny rolls, lower the quantity. But if you were making candy bars, there was another option: filler. Something to bulk the candy up, but at a lower price than sugar or chocolate. And if it tasted good, so much the better. Candy fillers start appearing in 1918. The ads that I’ve seen in the trade journals make a very explicit appeal to candy makers. The whole idea was to do more with less. In July, 1918, the California Associated Raisin Company extolled the use of raisins in candy: “Nowadays when all fillers are high-priced, Sun Maid Raisins can help you. The more raisins you use, the bigger your profits.” That same year, the Cincinnati Extract Works advertised its cherry, raspberry, and strawberry pieces with the header: “Conserve Sugar by Using Fruit Centers for Candies.” Merrell-Soule of Syracuse, N.Y. brought out a “New Filler” called Confectioners Mince. Candy-makers were instructed to “use it as you would use any other filler. It conserves sugar.” Coconut was popular, and as an added bonus it was a good filler too. Grains and cereals were especially attractive as fillers. They were cheap and bulky, and perhaps interesting in flavor and texture as well. 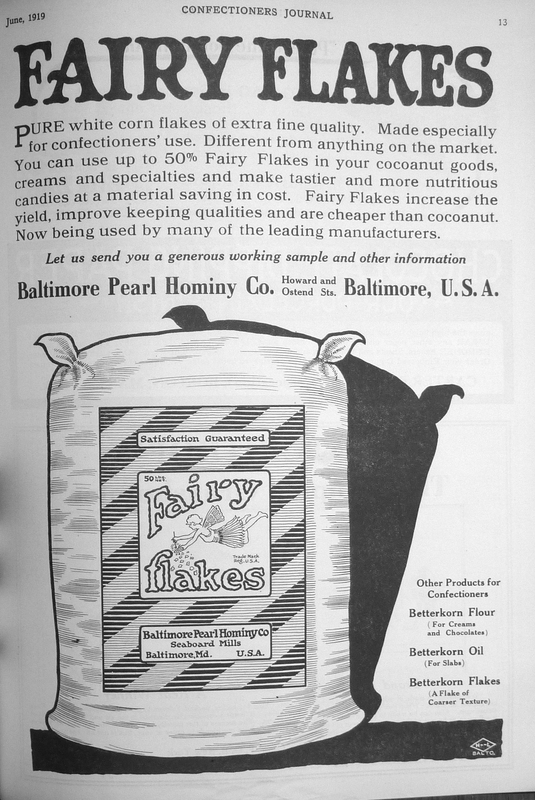 The Baltimore Pearl Hominy Company promoted “Fairy Flakes” as a good substitute for up to half the coconut in coconut bars. There is a way–a splendid way–whereby candy may be made with the greatest possible bulkiness–at the lowest possible cost–with the minimum amount of sugar… The problem of selling the consumer big satisfying dimes worth of high grade goods is solved. … This epoch-making candy ingredient is Puffed Wheat–or for that matter, Puffed Rice or Corn Puffs. Liberal use of nougat, creme, and caramel in candy combination was likewise the result of sugar conservation. New food processors had developed bases for these ingredients that used corn syrup or other sugars that were not rationed. The nougat and caramel bases were advertised as saving time and money, and thereby boosting the bottom line. The direct ancestors of what we know today as the “candy bar,” innovative concoctions appearing in 1919 and 1920 like Planters’ Chocolate Cluster Bar (peanuts, fruit, coconut and chocolate), Continental Candy Corp.’s Feasto (chocolate, marshmallow, caramel, and peanuts) or Mason’s Cocoanut Peaks (“Purity and Plenty”) were no doubt delicious. But they were something more as well: the ingenious inventions of clever candy makers who took economic necessity and made something sweet.